Skirmish line: Malaysian paratroopers and United States Marine secure the beachhead at Tanjung Resang in Malaysia's Johor state as LCACs disgorge troops and vehicles shipped ashore from the dock landing ship, USS Ashland (LSD-48). 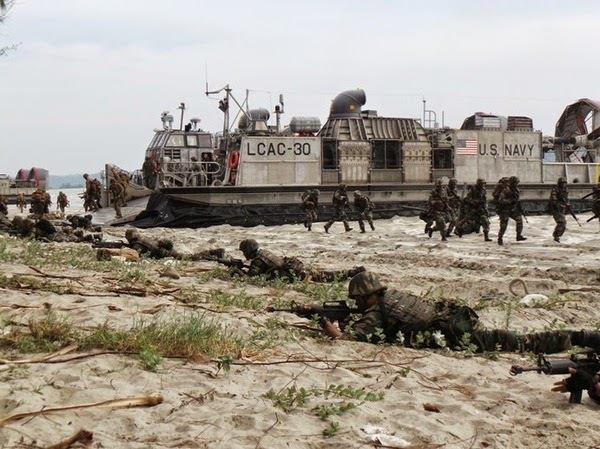 The amphibious landing capability demo was staged as part of the CARAT-Wira Eagle war games hosted by Malaysia. All images courtesy of Dzirhan Mahadzir, who witnessed the action firsthand at CARAT-Wira Eagle. 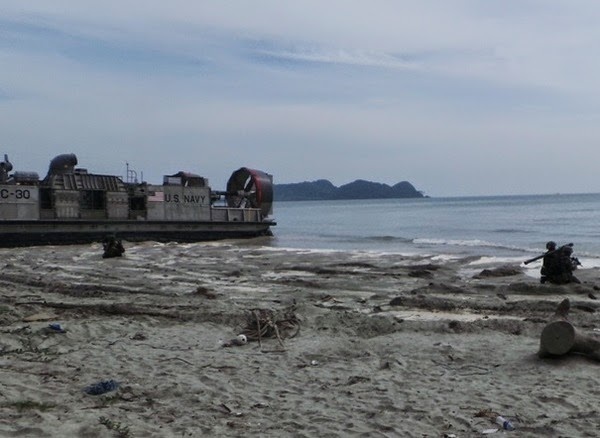 Attacking from the sea, warfighters from Malaysia and the United States stormed a beach at Tanjung Resang, just north of Mersing, yesterday in a joint show of force. The capability demonstration, staged as part of the CARAT-Wira Eagle war games (Wira is Malay for Hero), represent the second major MY-US military exercise held in the Federation this past week after United States Air Force F-22A Raptors and Royal Malaysian Air Force war machines launched the air power manoeuvres, Eksesais Cope Taufan 2014, on Monday. CARAT-Wira Eagle saw LCAC hovercraft, loaded with B-vehicles like ATM Vamtacs and USMC Hummers, despatched off Tg Resang from the dock landing ship, USS Ashland (LSD-48). The landing force was supported by AAV-7 tracked armoured carriers deployed from the Ashland. 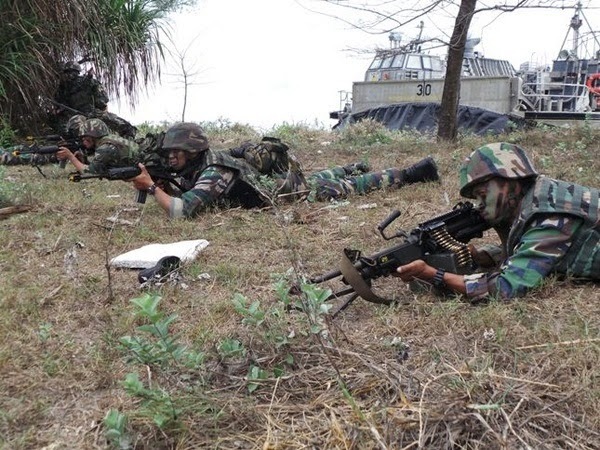 Malaysia's contribution to the amphibious landing force comprised elements from 9 RAMD (Para) (Rejimen Askar Melayu DiRaja - Royal Malay Regiment), which is part of the Malaysian Army's crack 10 Brigad Para (10th Parachute Brigade). The battalion's parent brigade is the Malaysian Army's Pasukan Aturgerak Cepat or Rapid Deployment Force. Paratroops from 9 RAMD are adept at securing enemy objectives from the air. The battalion is also the designated amphibious landing specialist in the Malaysian Army. At CARAT-Wira Eagle yesterday, Malaysian troops provided air defence cover (above) for the landing beach by deploying MANPADS fire units upon landing with the intention of protecting subsequent waves of LCACs from attacks by low-flying enemy warplanes or attack helicopters. The joint force defeated entrenched enemy infantry, who attempted to defend the beachhead, before securing the area for friendly forces. Malaysia and the United States enjoy warm and friendly defence relations. The military might demonstrated at CARAT-Wira Eagle and Eks Cope Taufan 2014 - the latter saw the US deploy its latest warplanes to the region for the first time - is indicative of concrete and continuing efforts by both countries to uplift their bilateral defence relations during joint exercises, defence courses, visits and exchanges of military personnel. Who are they supposed to be invading? Who is the unnamed enemy? I hope it is not Singapore. As if the US would assist them in such effort. in the event of an invasion from johor by any armed adversary, there are several ways the RMAF can fight back, and CARAT has just nicely shown how amphibious assaults can and may be used as in a counteroffensive posture, ala "back breaking: maneuver. as david has written, im more keen to believe that it does sharpen 9RAMD and 10Para's capabilities, although one will definitely not want to test that hypothesis. onto CARAT, the snark in me is (very) tempted to describe it as "american pittance towards the malaysians", esp when the SAF and RTAF (royal thai armed forces) are (possibly) having more engagements with US forces. but to round it off in a more politically correct and nuanced tone, its nevertheless good to see the americans engage more players in ASEAN nevertheless.